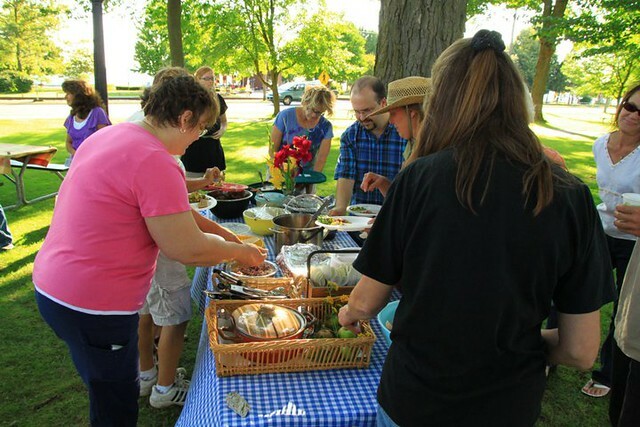 (Cadillac, Michigan, USA) - Transition Cadillac's FIRST 100 Mile Radius potluck / picnic was fantastic last night! About 35 friends and neighbors, aged from 4 months to 60 somethings, gathered in the park by the glistening waters of Lake Cadillac. We were fortunate to have clear skies and a balmy breeze. The FOOD was colorful and vibrant; amazingly FRESH, LOCAL, NOURISHING and YUMMY! 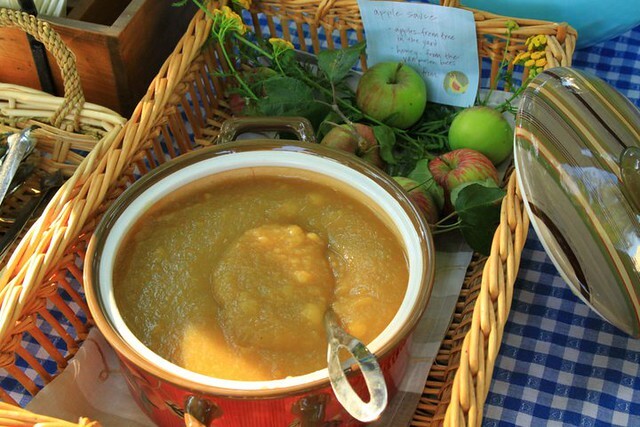 Ingredients were sourced from many back yard gardens and fruit trees; local farmers and our beloved Willow Mercantile. Chris Potter suggested that we put the recipes on our website and make a Local Food cook book [which will be collected via the website]. 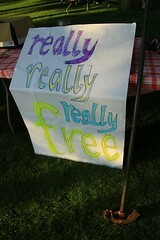 The Really Really Free Swap was also a great success! Everyone took home a special treasure. Chip Gadek commented that the swap was about GIVING, and it appeared so, as the items that people brought were very special indeed. 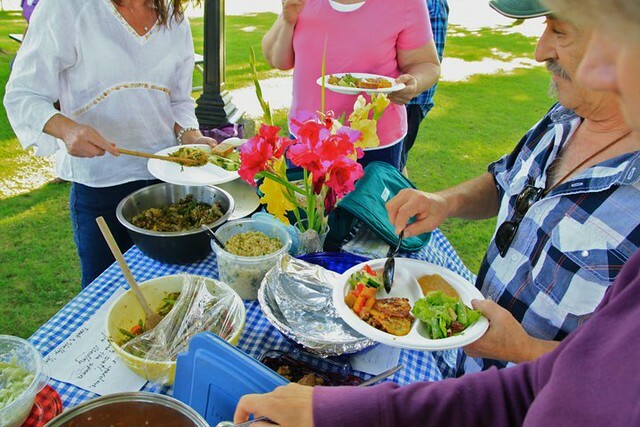 In addition to LOCAL FOOD and GIVING, there was far more to celebrate at our picnic. We celebrated Darcy Tacoma for making our new and beautiful brochure! Thank you SO much for your creative efforts Darcy! Your gift is an effective way to help our community learn more about Transition Cadillac. 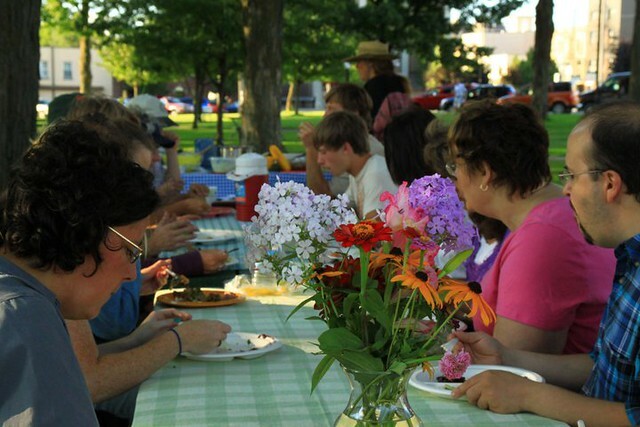 Perhaps, my favorite part, as I savored the aliveness of the food and friendships, was the rich feeling of community. I learned so much about the folks I sat with during our dinner, as we shared our respective stories of how we all happened to "land" in this beautiful area where we live. The evening resonated with sweet memories of the past, when people frequently met at the park for picnics, combined with exciting hope and opportunity for our locally resilient future. A heartfelt THANK YOU to everyone who contributed to this nourishing event! SYNERGY is the word that comes to mind, when good things happen in a community. For this particular event, we are grateful to experience how seeds of ideas, which came from our Steering Team members, grew into fruits of reality. Every single part of the whole is needed: posters to promote the 100 Mile Potluck and Really Really Free Swap, created by Linnea Stiffler and Megan Norman Meadows, distributed by many; tables and cheery tablecloths from The First Congregational Church; muscle provided by Karen Anderson and Dan Smith to move those tables; gardeners and farmers who grew the flowers and food to fill up our tables; compostable tableware provided by Anita Hunt to accommodate our fresh food; delightful signs made by Janice Heuer (from our Tech Team) to announce our potluck and swap at the park; Frank Youngman who was our resident photographer; and YOU who are an integral part of our community, contributing your unique presence and gifts. Adapted from original post here. Photos by Frank Youngman. Transition Cadillac is currently a "mulling" group who we hope will become an official transition initiative soon!